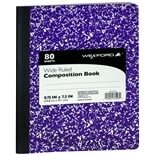 Write your important thoughts and class assignments in a composition book for safekeeping. 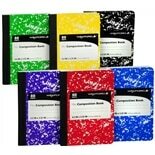 You can find composition books in 1 subject and 3 subject varieties that come with different numbers of sheets per book. There are various cover colors to choose from, and there's even an eco-friendly option. 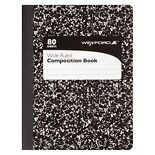 All of these types of Penway composition books are here at Walgreens.com. If you're looking for other paper supplies, we carry filler paper, spiral notebooks and journals. Loose leaf paper for 3 ring binders comes in both wide ruled and college ruled varieties. One-, two-, three- or five-subject spiral notebooks allow you to separate your notes by topics or semesters. Check out the rest of our selection of back-to-school basics, from pencils and pens to calculators. We carry an assortment of lunch bags and accessories as well as food storage containers to keep and transport your lunch. You'll also find backpacks and messenger bags to carry all of your books and schoolwork. Don't forget essentials such as binders and folders, notebooks and highlighters.